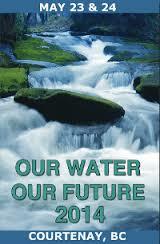 Vancouver Island Water Watch Coalition will be hosting their 3rd Water Forum, OUR WATER ~ OUR FUTURE~ 2014 on May 23 – 24 at the Filberg Centre in Courtenay with a great line up of speakers, and bus tours of two restoration sites within the Courtenay area. Attendance is free. Doors open 5:00 p.m. Friday evening. At 6:00 pm Damien Gillis will introduce and screen a portion of the film “Fractured Land” and answer any questions that may arise. Following the film Todd Butler will entertain everyone with humour and song. Saturday from 8:45 a.m. sessions begin with Kel Kelly as moderator. Guest speakers include Maude Barlow (Council of Canadians), Andrew Nikiforuk (freelance writer on energy and economics), Jessica Ernst (environmental consultant and anti-fracking activist) and Ingmar Lee (woodsman and direct action activist). In the afternoon, bus tours of the Tsolum River and Nile Creek Restoration Projects have been arranged. Lunch and refreshments will be provided. Enjoy a great line up of guest speakers, film, entertainment and tours of two local areas where volunteers have reclaimed the health of our watersheds. This entry was posted in Events, News and Events, Water by riverside11. Bookmark the permalink.